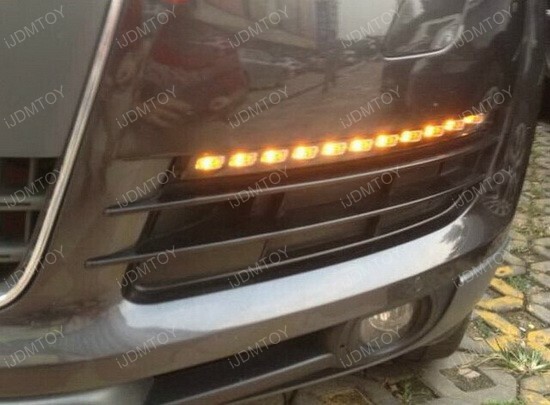 Q: Are these LED daytime running lights street legal? A: Yes, these lights are 100% street legal. A: Yes, since this is an add-on product, it will be error free. 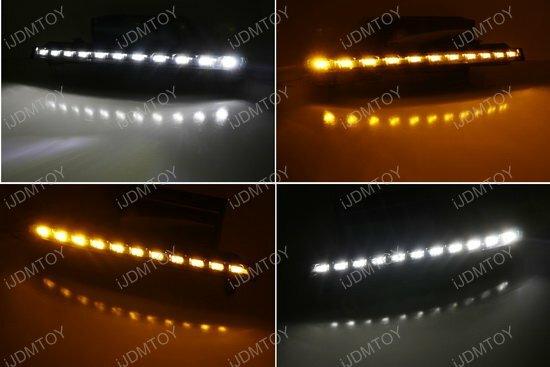 Q: Are these LED daytime running lights water proof? 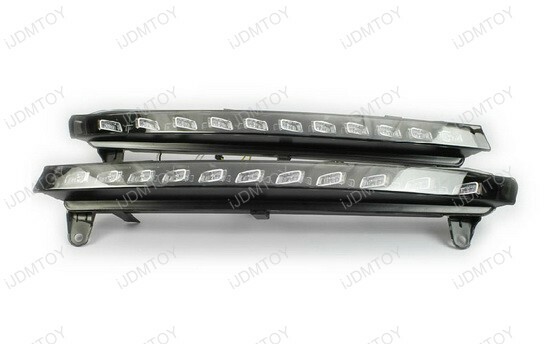 A: This LED daytime running light is rated at IP67 water resistant for exterior use. 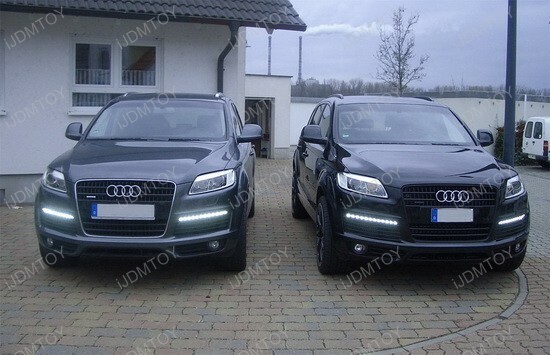 Q: How do I install these Audi Q7 LED Daytime Running Lights? A: Before you begin installation, please make sure your Audi Q7 is completely shut off, including its engine and its electronics. Otherwise, your Audi's onboard computer will detect that you've disconnected your stock turn signal/parking light set and an error message will pop up. Step 1: Remove the lower bumper bezel, unbolt the stock turn signal/parking lamp assembly. Step 2: Plug socket #1 into #2, the resistor decoder. Connect socket #3 to your parking light harness and socket #4 to your turn signal harness. Mount the resistor decoder onto a metal surface. 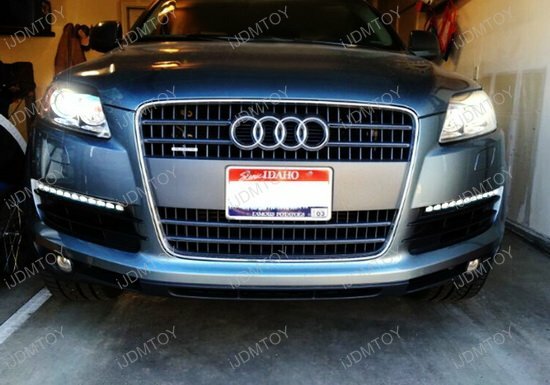 Step 3: Test to see if everything works before bolting on your Audi's new LED daytime running lights/turn signal lights. 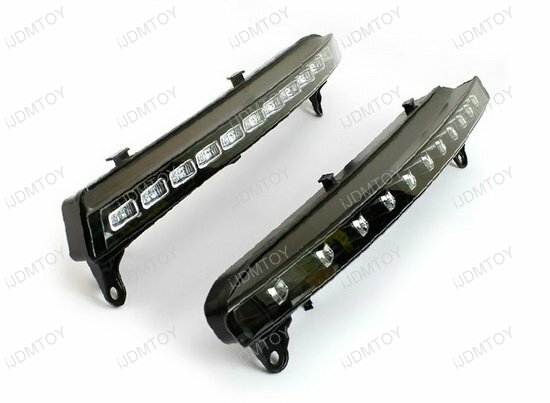 Once you've confirmed that both LED assemblies function properly, screw in the LED DRL turn signal light to finish. Repeat these steps for the other side. 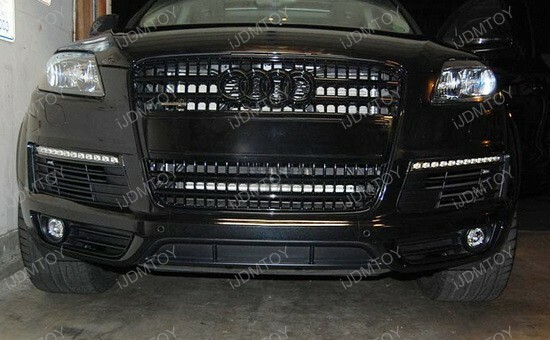 Enjoy your new Audi Q7 LED daytime running lights! 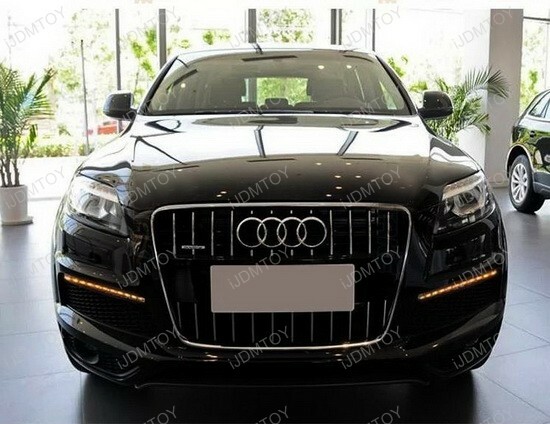 Q: How does this Q7 LED daytime running light function? 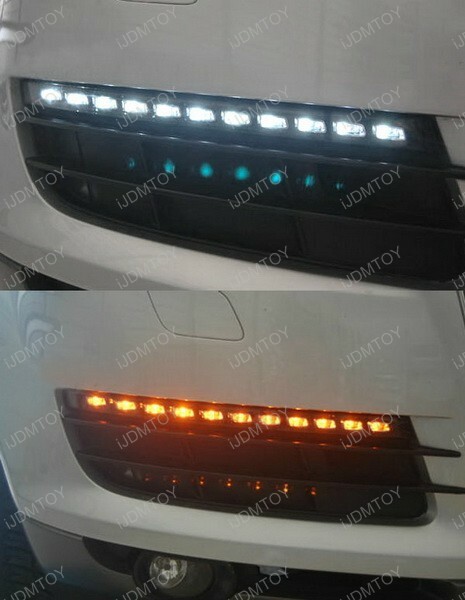 A: While your parking lights remain off, the LED DRL assembly will function only as turn signal lights, shining amber yellow. 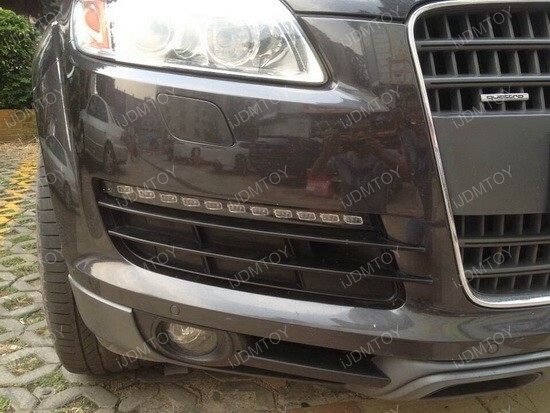 The LED daytime running lights will shine xenon white when your Audi's parking lights are switched on. 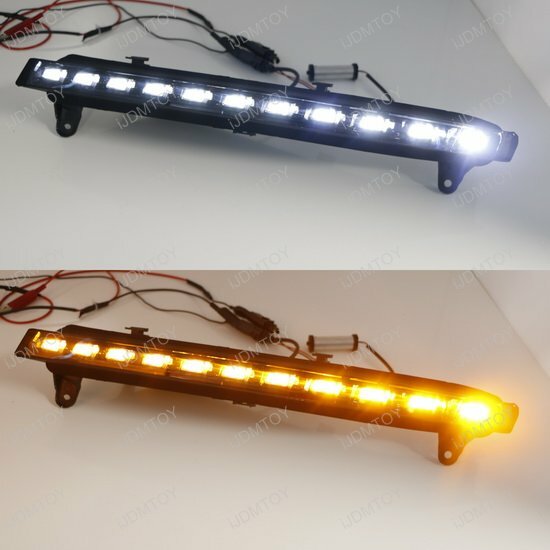 When you engage your turn signal lights, the LED DRL assembly will flash only in amber yellow (xenon white light turns off) until you complete your turn, switching back to the xenon white daytime running light. Q: How can I enable the xenon white LED to light up all the time? 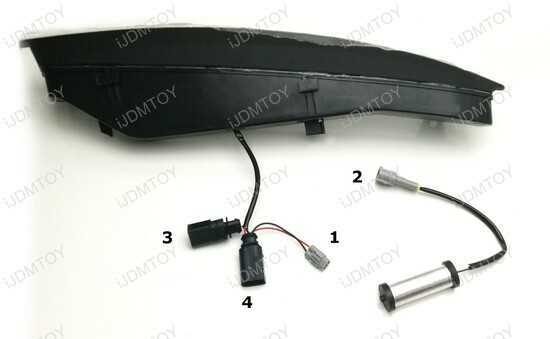 A: If you want to fully convert the xenon white LED as daytime running lights (meaning when you start the car, the xenon white LED will turn on), you just need to connect this #1 parking light adapter's two wires, one to fuse box ACC 12V+ and one to ground instead of the stock parking light socket. 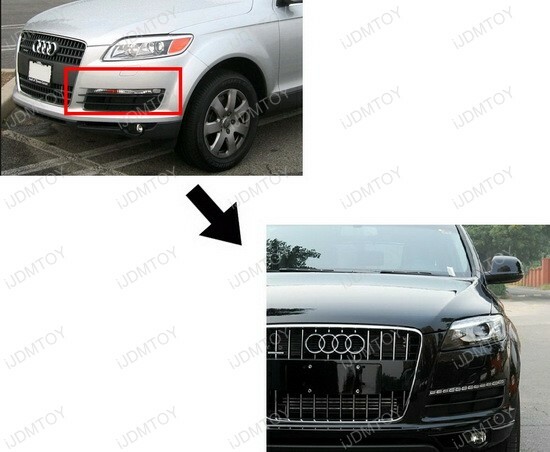 Q: Is this Q7 LED daytime running light error free? A: Yes, it is. Please make sure plug in adapter #1 to the error canceller decoders (#2) and properly mount them using zip-tie behind the LED daytime running lamp. If you still encounter error/warning issue, please double check the connection, make sure the error canceller decoders are properly connected. 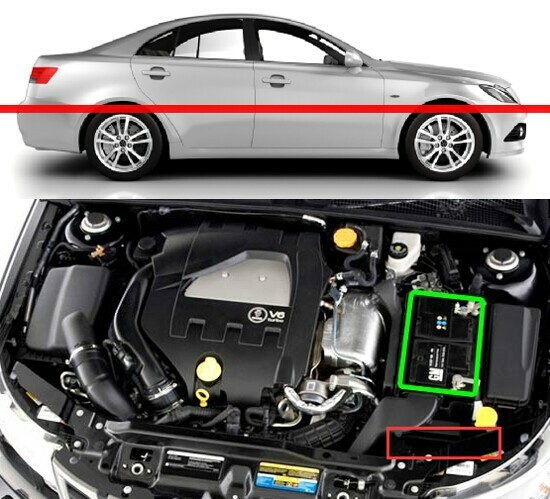 A: If this LED daytime running light has a module box, you MUST install with the module box. 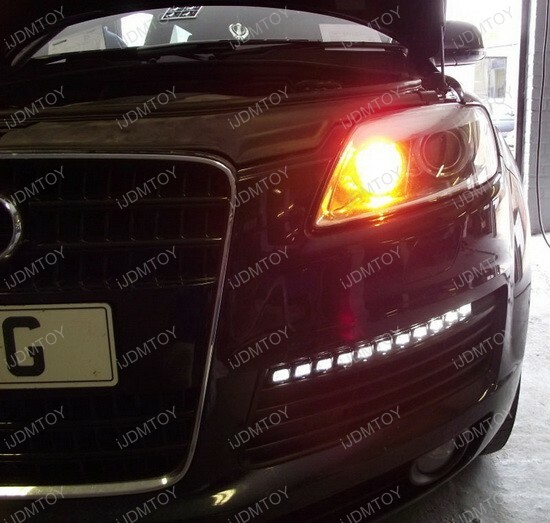 This page features one set xenon white/amber yellow 22-LED high power LED daytime running lights directly fit for 2007-2009 Audi Q7 before the facelift. 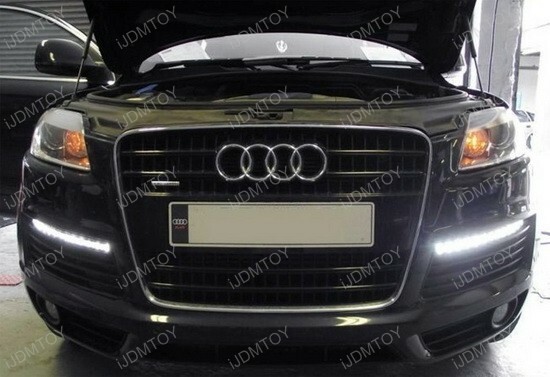 This LED daytime running lamp will directly replace the 2007-2010 Audi Q7's existing turn signal lamp/parking lamp for a nice OEM style LED daytime running lamp with turn signal features just like the newer 2011-up LCI Audi Q7. 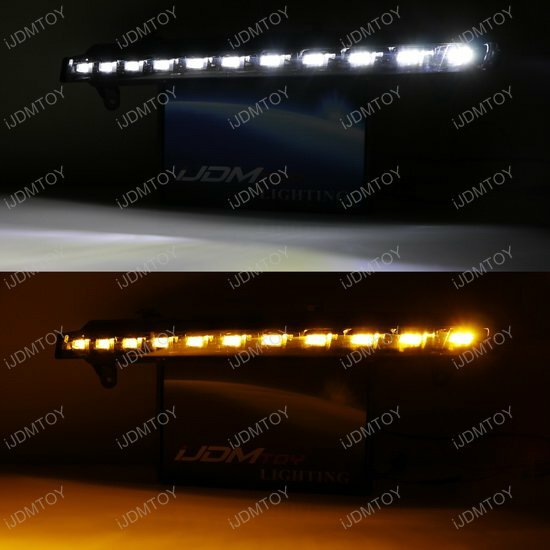 You get 11 pieces of xenon white for LED daytime running lights and 11 pieces of amber yellow LED for turn signal lights. This installation is plug and play with no modification required. Bought a set of these, and they fitted with no problems. Just plug and play. Had my qustions regarding US vz Euro models, but this went smothely. Great support via email, and a 5 day delivery from Cali to my post office. 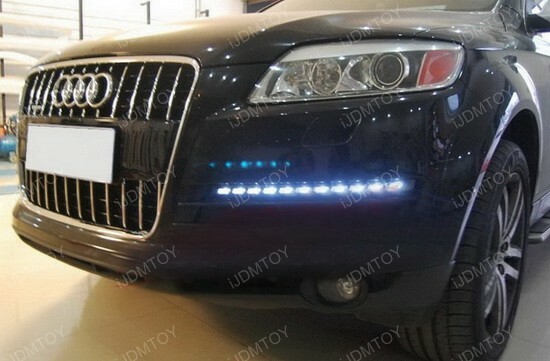 I bought these OEM look LED daytime running lamps for my 2008 Q7. First of all, the delivery is super fast. I ordered on Monday and received the next day. 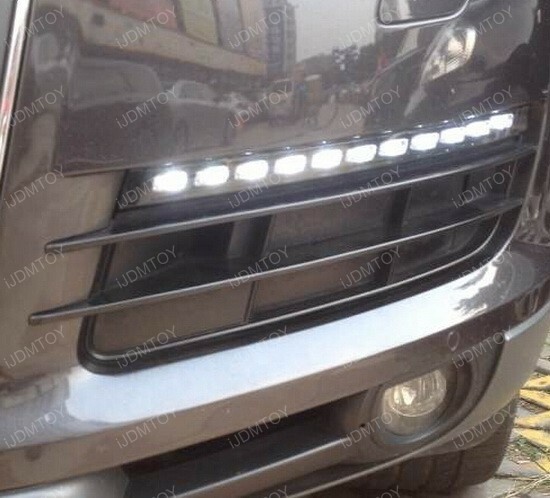 The installation is very easy, basically direct replacing the stock turn signal/parking light bar to LED. 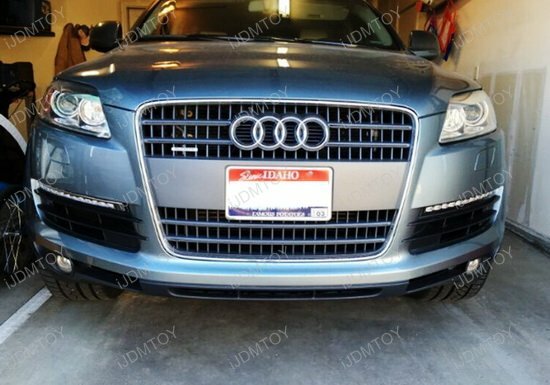 There's no error or bulb out warning message after the installation, and the new look makes my Audi Q7 looks much better now.